The Fulbright Program is the flagship international educational exchange program sponsored by the U.S. government and is designed to increase mutual understanding between the people of the United States and the people of other countries. Currently active in more than 155 countries, the Fulbright Program offers grants to study, teach and conduct research for U.S. citizens to go abroad and for non-U.S. citizens to come to the United States. From its inception, the Fulbright Program has fostered bilateral relationships in which other countries and governments work with the U.S. to set joint priorities and shape the program to meet shared needs. UNH’s Fulbright scholars have conducted research and taught in 41 countries, sharing their expertise in a range of disciplines, including agriculture and life sciences, engineering and physical sciences, environmental sciences, history and American studies, health sciences, social sciences, and theater arts. While many of UNH’s scholars hold appointments in the College of Liberal Arts, scholars have come from 34 departments across all of UNH’s colleges and two administrative departments. 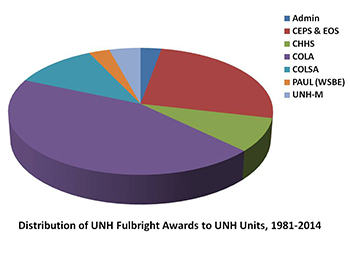 Between 1981 and 2014, UNH had at least one Fulbright scholar award in 29 of the 34 years, and in most years, had two or more. Other faculty who became Fulbrighters while at other institutions add to the collective UNH Fulbright experience. A few UNH awardees also had awards while elsewhere, and bring that added perspective to their scholarship at UNH. UNH’s Fulbright scholars report that their time abroad was exactly as the program materials described it would be – life-changing and rewarding both professionally and personally. While they all encountered challenges during their visits, the consensus is that those challenges made the experience all the more valuable. And many have found that their Fulbright-supported visit was just a starting point for their international scholarship. Even the most recent awardees already have seen their Fulbright experience lead to additional opportunities for working with colleagues outside the U.S.
Andrew Kun, associate professor of electrical and computer engineering, said that spending Spring semester 2014 in Hungary (where he was born) gave him a new perspective on the characteristics, strengths, and weaknesses of the U.S. and as a result, a renewed appreciation for this, his adopted home country. While in Hungary, he developed new relationships with scientists, engineers, and students at the University of Budapest and other sites within Hungary that he expects will continue to be productive. As an added benefit, he had the opportunity to strengthen collaborations with colleagues in London and Vienna. As a Fulbright Scholar in 2011-12, Monica Chiu, professor of English, taught Asian American studies and American literature at The University of Hong Kong. The international Fulbright seminar she organized led to the publishing of an edited collection. Her collaboration with her Hong Kong colleagues changed the focus of her research during the visit, and since she has returned to New Hampshire. Describing her Fulbright visit as “the best academic experience in my twenty years of teaching,” Chiu continues to reap benefits from her Fulbright award. She has met scholars from all over the world, who now invite her to visit them. She continues to contribute to publications with her Hong Kong colleagues. In addition, she has been invited to be an outside evaluator for the University of Hong Kong’s American Studies program in 2017-2020. Tom Safford, assistant professor of sociology, spent Fall semester 2104 in Brazil conducting research to better understand how access to and assessments of scientific and technical information shape the behavior of organizations engaged in development and environmental planning. He collaborated with faculty members and graduate students at two Santa Catarina universities, and will be returning to continue his fieldwork this spring with financial support from Brazil. 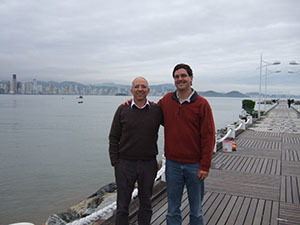 New research projects in Brazil that will involve UNH colleagues and new Brazilian ones are in the planning stages. Another benefit of what Safford described as “an amazing personal and professional experience” is that his Brazilian work has given him new ideas and new questions for his research in New Hampshire. Ask any Fulbrighter, no matter how long ago their visit, and the response likely will be equally as enthusiastic. Drew Conroy, professor of applied animal science, continues to share his 2008 Fulbright experiences in Namibia with his students through his mentoring and his courses, including using Skype to have one of his Namibian colleagues present a lecture each year. 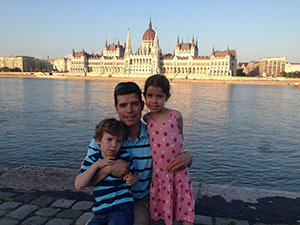 Read more about Professor Conroy's Fulbright experiences. Another professor recently said that her Fulbright visit 15 years ago was “magical” and continues to influence how she approaches her teaching and service to the University. Others are active in the national and New Hampshire chapters of the Fulbright Association, building and maintaining relationships among Fulbrighters, and sharing their commitment to international scholarship with faculty, students, friends, and family. 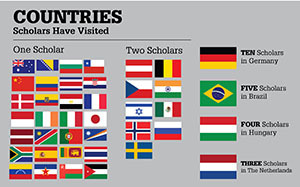 Further evidence: about 20% of UNH Scholars have received second, and some, third, Fulbright awards, and most of them have maintained and even expanded their international scholarship activities. All in all, UNH has a long, successful relationship with the Fulbright Scholars program. Not only have UNH faculty served as cultural ambassadors for the U.S., they have taken the University worldwide. And when they have come home, they have brought the world to UNH. 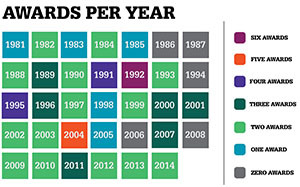 Thanks to the US Dept. of State, Bureau of Education and Cultural Affairs for the description of the Fulbright program.